A CROWD of over 1,600 watched Dumbarton grab the three points from Queen of the South in an exciting match at sunlit Palmerston Park, Dumfries. 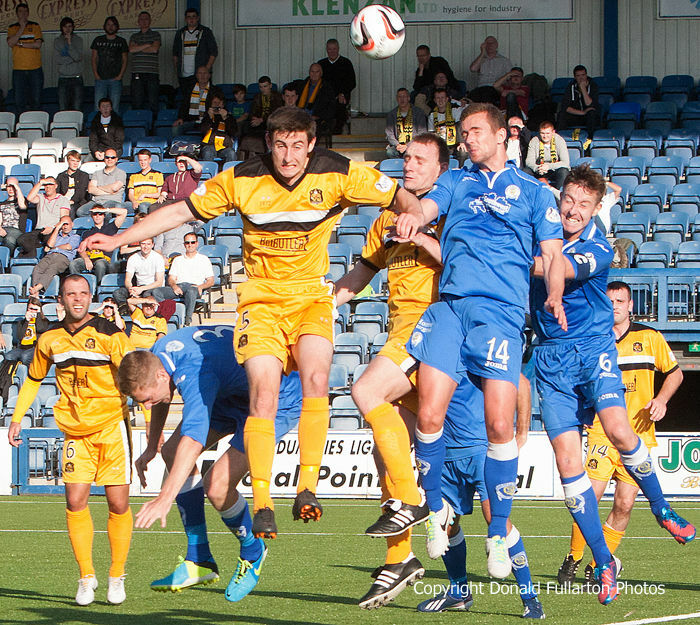 A CROWD of over 1,600 watched Dumbarton grab the three points from Queen of the South in an exciting match in bright sunshine at Palmerston Park, Dumfries. Sons were facing a full-time Doonhamers side managed by Dumbarton man Jim McIntyre, with ex-Dumbarton manager Gerry McCabe as his no.2 and ex-Sons striker Iain Russell featuring up front. Playing into the sun in the first half the visitors showed that they planned to attack, and midfielder Chris Turner opened the scoring with a long range volley. A few minutes later that man Russell — who makes a habit of scoring against his old club — netted the equaliser from close range. After the break the home side took command for a long spell but could not add to their score, but Sons came back into the match in the later stages and mounted waves of attacks. Three minutes from the end the visitors got their reward when Bryan Prunty crossed for Garry Fleming to net from close range. It proved to be the winner as they held out through three minutes of extra time. The picture shows Aaron Barry winning an aerial duel.